The next pork product could come from a petri dish. From an economic and environmental perspective, meat has some problems. Animals consume a great deal of resources in their growth and they release a large amount of methane, a greenhouse gas. There’s also the whole ethical debate: is killing a cute snuggly animal permissible if it tastes really good? Researchers in the Netherlands may be able to sidestep ethics and solve some of the environmental issues with their latest creation – pork cells cultured in a petri dish. This artificial meat is grown from myoblasts (special muscle cells which repair damage) incubated in a solution derived from the blood products of animal fetuses. Sounds gruesome, but scientists hope to eventually switch to a synthetic medium for culturing the cells. Mark Post, the head investigator for the project at Eindhoven University of Technology, believes that the artificial pork could be ready for use in sausage in as little as five years. I find that to be a remarkable accomplishment, Jon Stewart much less so. You can find his reaction in the video from the Daily Show after the break. We’ve had artificial meat in other forms for almost a decade. Scientists at Touro College in New York worked with NASA to develop an artificial fish fillet for astronauts on long space voyages. In that experiment, fish muscles were coaxed to grow in a solution after being sliced off of goldfish. In contrast, the new Dutch work is so promising because the pork grown does not require any animal to be injured during production. If ultimately successful, the Eindhoven technique may lead to a whole range of artificially grown animal products including seafood, chicken, and beef. To address some of Mr. Stewart’s concerns, it should be pointed out that the cells have the consistency of ‘soggy pork’ because they have not been exercised. Muscle cells require stimulation to be stretched and hardened into the ‘steak-like’ texture people prefer. Once enough artificial pork is produced, I imagine that electric currents could easily be used to induce movement that would toughen and improve the meat. Likewise, Post’s comments that the meat will be fit for sausage in five years isn’t a dig at the quality of the product. The research is backed by a sausage manufacturer (and by L2 millino from the Dutch government) and much of the time in the next five years will be devoted to rigorous testing to insure that the meat is safe to eat. It’s not an issue of taste. Even when artificial meat is ready to come to market, I’m not convinced it’s the right solution to our meat problems. Sure, artificially grown meat is PETA and NASA approved, but will it really resolve our economic and environmental issues? How much greenhouse gas is released during the careful culturing of these cells? Will economies of scale allow us to use artificial meat as a cheaper alternative to the real thing? Right now, the solution used to culture the pork cells costs hundreds of dollars per liter. A synthetic solution to culture the myoblasts is likely on the horizon, and that could quell my concerns about costs. But there’s even more to consider. Most genetically modified animals and plants have a greater susceptibility to devastation from a single disease or toxin. Many of the pigs grown in the west have to be kept in sterile environments to avoid loss of herds. 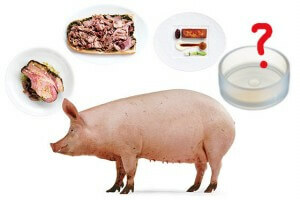 The artificial pork from Eindhoven is not genetically modified, but it faces the same limitation: a narrow gene pool. In a traditional farm a thousand pigs would have a thousand genomes with a great deal of variation. In a GM farm, there is much less variation. In an artificial meat factory, thousands of pounds of product could come from the same DNA. That’s a liability. Of course, it’s also an opportunity. We could find (or create) that one strand of pig DNA that produces the most succulent and delicious artificial meat ever. I do believe that it will come down to taste. If you can create an animal product that tastes as good or better than the real thing, and has the nifty ethical, and environmental benefits, it’s going to be a best seller. The next five years will reveal if ‘Dutch sausage’ can become the first marketable artificial meat. Just don’t ask Jon Stewart to be the first to try it.